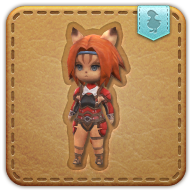 Summon your wind-up Mithra minion. Opinions on how Miqo'te rate compared to their supposed ancestors are best kept to oneself. A stack of dusty tomes and a healthy imagination served as inspiration for this automaton designed to depict the Mithra─supposed ancestor of the Miqo'te. She wears a traditional scorpion harness rendered in painstaking—and pointless—detail by her Sharlayan creator.